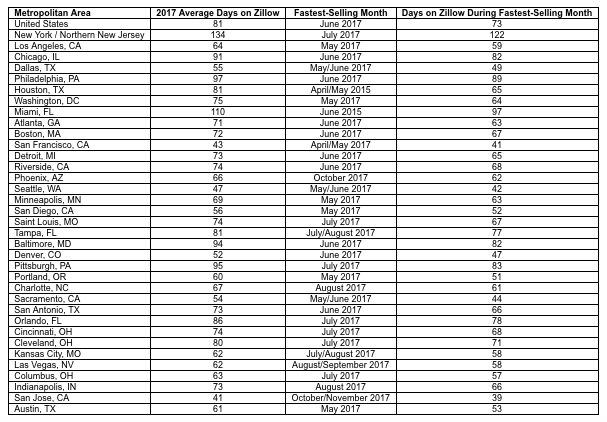 In 2017, the median U.S. home sold in 81 days — down from 90 days in 2016 — with June being the quickest selling month as homes flew off the market in 73 days, including closing time, according to a new analysis from Zillow. On the metro level, San Jose, California, was the fastest-selling market with homes being snapped up by buyers typically in 41 days. Concurrently, the city had a 26.8-percent year-over-year drop in inventory, the biggest decline among the 35 largest metropolitan statistical areas (MSAs). Lastly, homes in San Jose sold quickest in October, at just 39 days. On the other hand, Houston and Miami experienced slightly slower sales paces in 2017. In Houston, homes sold in 81 days instead of 80, and in Miami, the home sales pace remained flat at 110 days. Although snow and cold weather has plagued much of the country this spring, homebuying speeds are expected to heat up since year-over-year inventory has fallen for a consecutive 37 months. The continual decline in inventory is also forcing buyers to become more competitive in their offers. In 2017, 25 percent of homes sold for more than asking price, a trend that is expected to hold throughout 2018. “Being prepared — working with a great agent, getting financing preapproved — can help a buyer make a stand-out offer,” Terrazas added. To help your buyers win in a multiple-offer situation, Inman contributor Tim Burrell suggests agents first get an accurate number of how many buyers are bidding on the home. Next he suggests finding “what the most significant term of the offer is and give it to the seller.” For some sellers garnering the highest sales price is the most important thing, while, for example, others may need to sell within a particular time frame. Lastly, Burrell suggests getting your offer in first, making sure that offer fulfills all of the seller’s wishes, and putting a short acceptance time on the offer.